Our partner for scuba diving is Savedra Dive Center. Savedra Dive Center is a modern dive center and offers dive courses from beginner to Instructor level. Course material is available in many languages, including English, German, Spanish, Italian, Chinese, Japanese, Korean, Russian, Dutch and others. 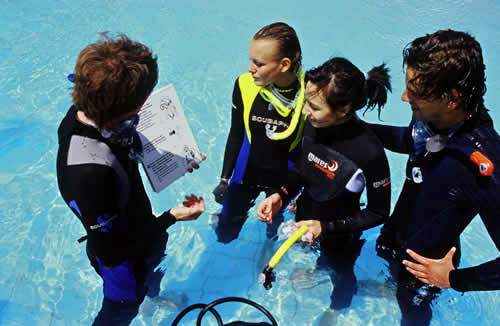 The international team of diving instructors is very professional, experienced and multilingual. Savedra Dive Center offers dive courses from the 2 biggest dive training associations in the world, PADI and SSI. Both associations offer excellent training courses, training material and are acknowledged worldwide. If you are not sure which of these two agencies to select, just let us know which course you are intersted in and we come back to you with info on how to select the right course for you. Please contact us for specialty courses like deep diver, shark diver, dive master, dive con and instructor level courses. Scuba Diving in Cebu: Cabana Beach Club Resort is one of several beach resorts in Moalboal, Cebu, and the perfect place to go for scuba diving and relaxation. This website is made by the travel department of Seven Seas Aquanauts Corp. in order to promote Cabana Beach Club Resorts. Seven Seas Aquanuats Corp. operates Savedra Dive Center in Moalboal, a PADI 5 Star Dive Center adjacent to Cabana Beach Club Resort. Savedra Dive Center is the preferred dive center for Cabana Beach Club Resorts guests. Our in-house travel desk will take care of all your requests and bookings initiated by this website.